A hurricane is hitting Greece. The Medicane is called ZORBAS! 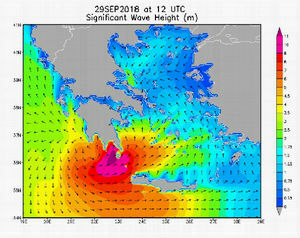 Meteo Greece is predicting wave heights of 10+ meters. This is a wave height, I haven't seen in any prediction for the Mediterranean. I doubled all lines and we hope, that the storm is going a different track. As the forecasts models seem to be a bit stressed, we really do not know, where it will pass through. Every hour we get a different forecast.